Because of this, taking a break is scary. Running a business all by yourself is demanding, to say the least. How will I ever find the energy required to get back into the game if I allow myself to disconnect? This is of course not a healthy mindset at all. It is paramount that we frequently step away from work and give ourselves enough time to rest and reflect. I desperately needed that, and I also know that I gained some seriously valuable insights during my time away. Even the most fun projects (especially the fun projects) can feel overwhelming to me when I’ve been out of it for a while. Creating is challenging, and it requires a lot from me. That… spark, that I need to create recipes and photos worthy of this blog is not something that’s always there, ready to be used. It’s more like a little circus animal inside of me, that I need to fuel and take out for regular walks and practice in order for it to be fit and happy. We need to spend a lot of time together in order to perform in synchronicity. If I’ve neglected it for too long, the circus animal forget its tricks. We fall out of synch and we have to go through this whole process of slowly re-learn our dance in order to tap into that creative source again. The quote above is from a blog post I wrote back in April, when I was in a similar phase of low motivation. I re-read it today, and omg it was so helpful! I really needed to remind myself that I DO have it in me to go the extra mile and do what I gotta do to reach my goals. Re-reading that post was the permission slip I needed to simply get started, and get started anywhere. To bring my circus animal into the ring (do you say ’ring’ when it’s a circus?) and start with some simple scissor jumps and high knees. In a week or two we will be back in business, I know it. Until then I just need to be kind to myself and adopt the ”good enough” mindset. Lucky for me, I created and shot this recipe in a creative high right before my vacation. Doing a production race and bulking up on blog material before my vacation was probably my most genius idea ever. Gotta remember to thank myself for that! It’s been incredibly relieving not having to deal with this first thing when I got back. Instead I can take things slow here in the background and figure out what’s next :-) I can highly recommend being on top of your content creation so that you always have material ready for the coming 1-2 weeks, rather than stress-creating it last minute. I’ve made versions of this cold soup of years, whenever I feel a little funky and need to flush out toxins and fuel my body with as nutrient dense foods as possible. Chewing down a huge bowl of salad and raw vegetables can sometimes be pretty demanding for your digestion, but you still wanna get all that vibrant plant power into your body, right? That’s when the blender comes in handy! Ever since I got back from my travels, I’ve made big smoothie bowls each morning, and some nights I’ve made this raw, savory soup. Running the vegetables through the mixer helps to break down the fibers which makes it easier to digest and the nutrients more readily available. 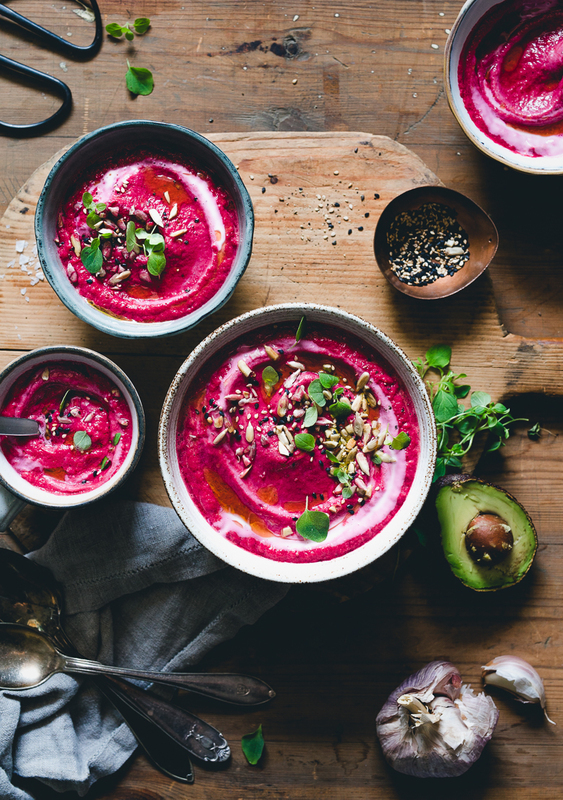 Swapping out some of my cooked meals (with emphasis on some, not all) for raw soups and smoothies during a week or two usually brings me out of that sluggishness and makes me feel clear-minded, light and full of energy! Now I know what you’re thinking. How will I possibly get full enough from just a handful of raw vegetables? Don’t worry, this soup has plenty of fat in it too. Avocado, olive oil and a generous seed sprinkle on top. I usually find that this is enough. But if you want to, feel free to have a slice of rye bread smeared with hummus on the side. Whatever makes you feel fueled and satisfied. Come to think of it, that would be delicious! 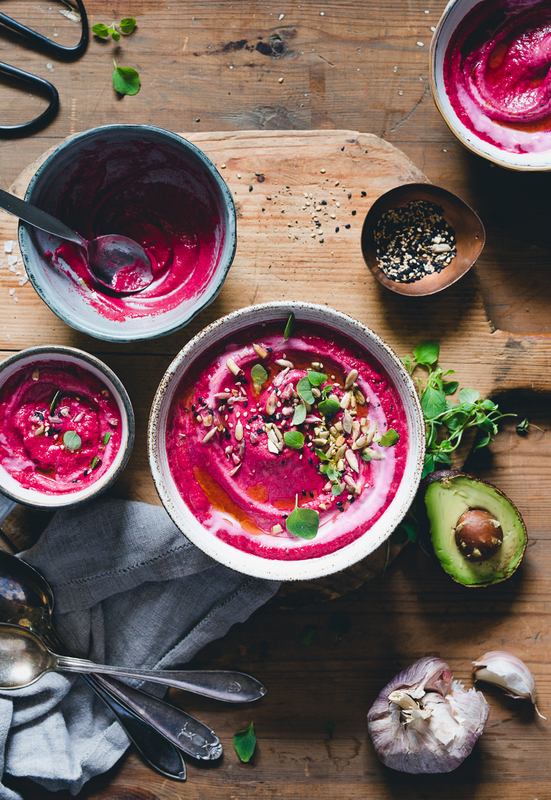 This savory, chilled soup is completely raw, vegan & gluten-free. I guess you can call this a ”detox recipe”, but I have conflicted feelings about that term. 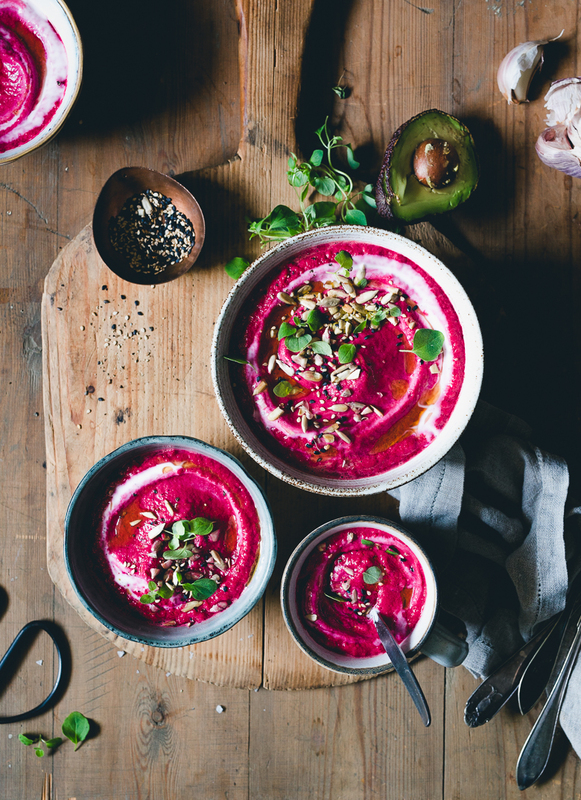 Let’s just say this chilled beetroot & avocado soup is gonna make you feel awesome, inside out ;-) Perfect for when you wanna add a little extra glow to that skin, hair and mood of yours. Bonus points for doubling as a fancy, colorful starter when served in cute little glasses! Roughly chop cucumber, celery & avocado. Also chop shallot and mince garlic. Peel the beetroot and grate it roughly (if you have a high-speed blender you can simply chop it). Remove kernels from the dates. Throw it all into the blender, along with sun-dried tomatoes (pre-soak in hot water for 10 min if they are completely dry), lemon juice, olive oil, tamari, apple cider vinegar and spices. Mix until creamy and smooth. Season to taste with salt & pepper, and add water if you want a thinner consistency. Serve immediately with fresh oregano, toasted seeds and drizzle of olive oil. If you want the soup really cold, you can add a couple of ice cubes to each bowl/serving glass right before serving. In that case I would opt for a thinner soup and serve it as a starter. As a main course, my personal preference is a thicker and room-tempered soup :-) I find that this works best for my digestion. 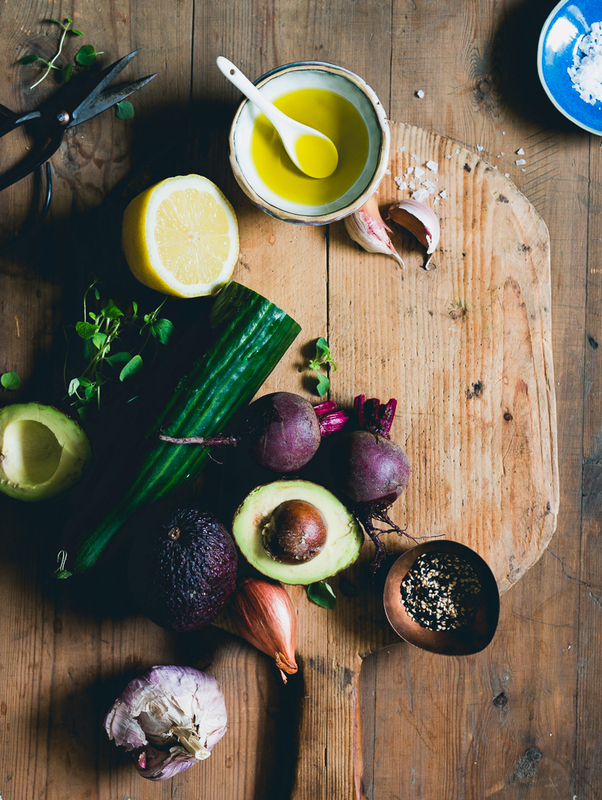 Looking for more raw food inspiration? Check out these recipes from the archive! Thank you for sharing your thoughts about getting back into the ”wheel” after a trip. Oh do I know that feeling so well, totally relate to your experience. Hope it makes you feel better, that you are not alone there. I’ve always been a bit of estranged of cold soups, maybe being German my mind thinks that soups need to be hot. But this one sounds really appealing to me, I’ll give it a try since your images are so intriguing. Så fint att läsa dina tankar om din process. Känner igen mig mycket även om det har varit så annorlunda för mig de senaste åren. Hoppas att du kommer in i tempot lagom fort och kan ta hand om dig på bästa sätt i det. Kram!